Aren&apos;t there times while you are in a gray city but you want to take a rest in the green forest? After much thought, we wish to providea small resting space as a gift to those who can&apos;t spare the time to &apos;relax&apos; by looking at the sky in their daily lives. 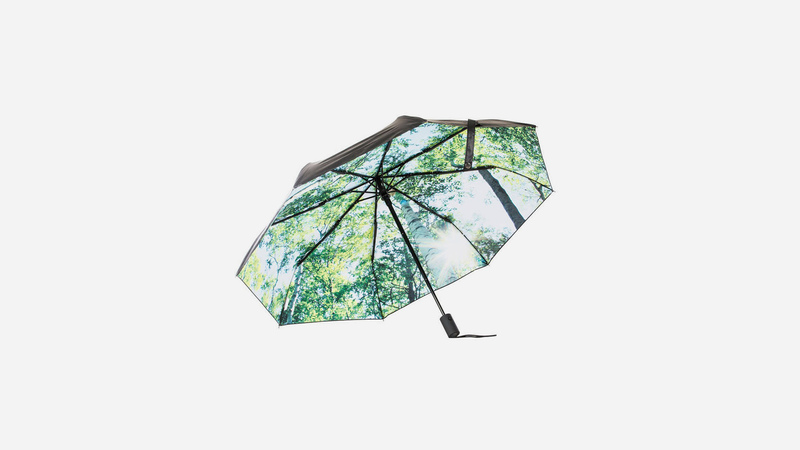 &apos;Forest Umbrella&apos; will create a small forest on top of your head when you open the umbrella. Even on a gloomy day it will look like you are walking under a forest with fresh air. Compared to the simple exterior design, the bright forest interior design will make your heart flutter with the thought of having your &apos;own&apos; forest. Enjoy the feeling of walking down a forest trail with the umbrella when it is raining, snowing, sunny or when you just want to have time for yourself. The time you spend in the space for yourself will add energy to your life and if you are with a love done, your happiness will double.